No classic arcade is complete without a selection of great prizes that you can win with ticket-redemption games and an assortment of crane and other games. 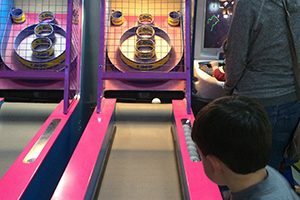 Whether you enjoy playing Big Bass, Big Buck Hunter, Monster Drop, Frogger, our Jurassic Park shooting game, or other classic arcade games or prefer trying your luck with ski ball, air hockey, or one of several crane and other prize-retrieving games that test your hand-eye coordination, you can win tickets toward prizes. You even can pluck a great prize from an assortment of crane games, sure to put on a smile on the winners’ faces! Among the many great prizes available are candy, jewelry, cotton candy, dolls, dart guns, guitars, headphones, remote-controlled cars and helicopters, and many others. We carefully select our prizes to ensure anyone of any age can find something that will provide long-lasting fun and can bring out the kid in many adults. 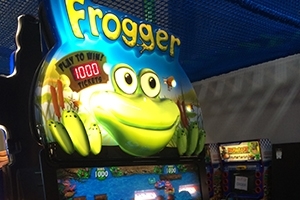 Whether you are young or old, you will have great fun playing the many classic gaming titles and trying to set the new high score on Frogger, Sports Arena, Treasure Quest, Moon Rally, Big Bass, and many others. We carefully select our titles to ensure the best in stand-up gaming, and professionally maintain them so that you, your family, and your friends can enjoy hours of fun and excitement. 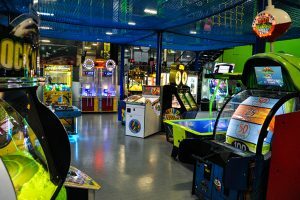 All great arcades have air hockey, basketball games, skeeball, and shooting games to challenge your skills while having a blast. Our many great skills-based games include the classic Big Buck Hunter shooting game, Hoop Fever, air hockey, and Ice Balls, for when you want to test your skeeball skills. Whether young or old, our assortment of skills-based games will challenge your athletic prowess while making you enjoy every second of the experience. Few gaming activities are more fun than racing against others on a variety of digitally-enhanced video courses. Our selection of great driving games includes two Mario Kart games, where you can compete against others on the most fun race courses ever devised. You also can test your driving skills on the Arctic Thunder driving game and shoot for a high score. We know you can work up a sweat and appetite while playing the many great games at the Zero Gravity arcade. That’s why we provide an assortment of vending machines dispensing cold drinks, chips, and candy, and ice cream treats that are almost as fun to eat as the games are to play. When you come to Zero Gravity Trampoline Park, we make sure you have all you need to ensure your family has a great time in Minneapolis, MN!